I retired at the end of April and I wanted to do some things, first off was get all my tools back into my toolbox in the garage instead of being spread out over the 2 garages and the house. I gathered what I find in tools and quickly discovered that I have so many tools that quickly overwhelmed the 27 inch wide toolbox. After talking to the wife we went toolbox hunting and since we have no Sears nearby we went to Lowe's, Home Depot and Harbor Freight. Well Lowe's and Home Depot had boxes but they were cheaply made and disappointing to me, thin metal, full of gimmicks like a built in power strip and just really felt cheap. Then we went to Harbor Freight, I was amazed at the toolboxes they had, yeah they had the el-cheapo boxes but then I found a really nice 56" box I like but the boss like the 44" box and she wanted me to have the top box, side box and closet and I liked the set up. The metal felt comparable to my old Waterloo tool box but a much larger size. Who is to argue with the boss I immediately agreed and bought the combination. So I got the whole shebang home and got everything out of the boxes and pallets and I was amazed at the size of what I just bought. I immediately started to wax the box and then I started the process of putting all my tools in the new chest. The only things I left in my old toolbox were my old Bonney toolset which I bought when I first went aviation 37 years ago. The Bonney set is at best incomplete but I do not want anybody touching those tools as they are what earned my money for 27 years until my former employer started to provide tools. After I got all my tools put in the new box I started cleaning, removing, and organizing my garage. For the last 19 years it was a dumping ground for me and I could hardly move around in it. I made 4 runs to the dump getting rid of junk and debris. I filled 21 garage cans full of garbage and I still bought out stuff the dump would not accept, like old lawn mowers, weed walkers, air compressor and a old steel lawn tractor trailer. I just pull it all out to the curb and posted a ad on Craigslist for free items that stuff disappeared in 2 hours. 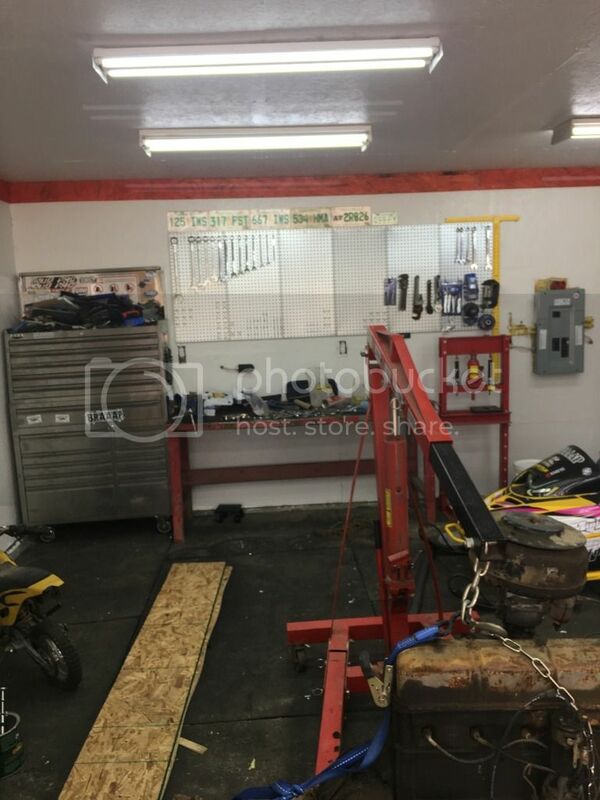 Now my shop is getting cleared out and I can see the floor again. I still have more work to do in the back of the garage as I want to store some other stuff that is still in the other garage but I still have a few runs to the dump to rid of that stuff. But I can see the end is coming and since I am retired I can take my time to slowly move the stuff over. I have been able to mount the new bench grinder that I bought four years ago and never got around to doing until now. I realize that this is going to be a ongoing project and I will be getting to the point of finally having my garage arranged and the wife is happy as I stay out of her hair and she has her time. I also can take care of the yard and property when I need to and any time I feel like it. I saw this at Home Depot last week and it is nice and not to gimmicky and for the price is a nice home owner box, sure not for a working mechanic who needs to move his box a lot. When I went to Home Depot they had none of these just the cheaper one for for $598 that did not impress me. Had they had this one I might of gone for it but since they had none when I was buying I got the Harbor Freight one and I really like it. Has plenty of room and all the drawers are already filled. Edit I do not know what the price in Canada would be but it sure is nice. That looks pretty Nice, My current Box is an old one from Costco. I picked it up in 2011 for around $450. After that the prices have since doubled, I saw Homedepot did have one in their last flyer for 598, I wonder if it was the same one. Its just something Ill be keeping my eye open for. That sounds like a clean up and a half! Congrats on retirement! Home Depot has 2 boxes in that size of what I pictured. A matte finished black one for $598 and the glossy black one for $698 if you look and it is the matte finish one you will see that it has the only 4 casters and the glossy black one has 6 casters. If it is the glossy black at $598 that is probably a good buy. As I said in a earlier posting if that had been on sale and available I would grabbed it but since they had none on display and none available I ended up with the Harbor Freight setup that I bought. Right now there is a ad for the Harbor Freight 44" at $349 for the bottom box only and $269 for the top box. I still do not care if the box does not have power outlets as I do not need power outlets what I wanted was a basic box with thicker metal. Also I do not need the curved metal on the top box as for me the majority of the time my tool box will left open, only when the grandkids are around will I ever even lock up and close it. Wow, looks great! Nice job! That is looking to the front of the shop. Spin 180 degrees and back still needs lots of cleaning. I just today took out a full 8' pickup truck load stacked to even with the cab roof and I still have more stuff back there. I did pull out a old and I mean old (at least 35-40 Years old) Craftsman Lawn Sweeper I did not know I had. I guess I do a Craigslist ad for half to 3/4ths what a new cost and be happy with ever money I get out of it. I get some pictures later of it. I have a similar box from Home Depot. 62" high x 52" wide x 18" deep. Its a really nice box, lots of room and pretty sturdy too. I got most of my tools into it. Now I need another one for the rest... Only thing is the packaging is HUGE. I had to make 2 trips to HD with my Expedition to get it. That appears to be the nicest box that Home Depot has, they did not have any of the other brands toolboxes if I could remember the brand they make a really good electric tools.. The HD near me has Milwaukee brand tool boxes, fairly similar to the Husky brand but painted in Milwaukee red.